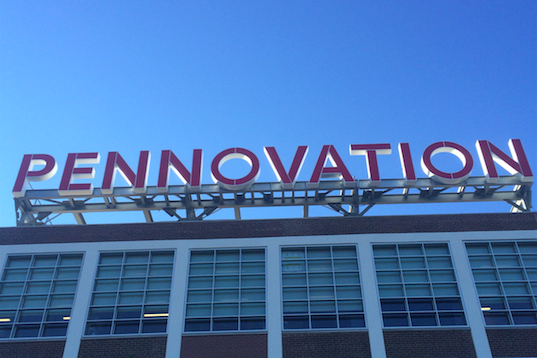 The Pennovation Center at the Pennovation Works campus of the University of Pennsylvania, located at 3401 Gray's Ferry Avenue. 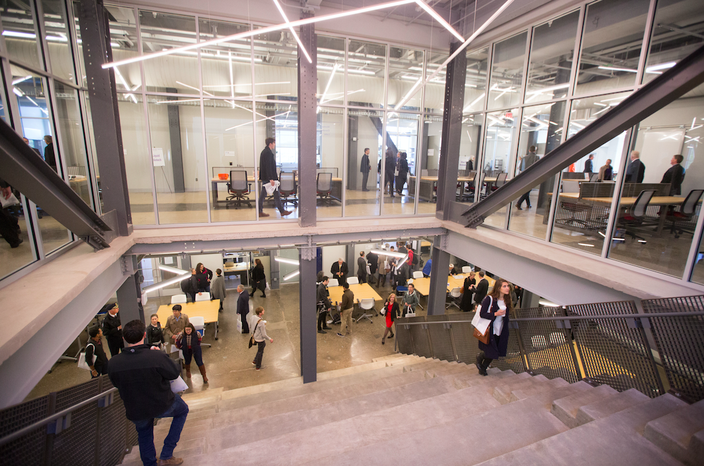 Every shimmering detail of the University of Pennsylvania's new business incubator and lab is cutting edge, right down the 3D printed scissors ushered on stage by a robot to cut the ceremonial ribbon. Over the past few months, the futuristic Pennovation Center has quietly gotten to work on a mission that seeks nothing less than to change the way Philadelphia's community of scientific entrepreneurs connects with the city, the region and the world. 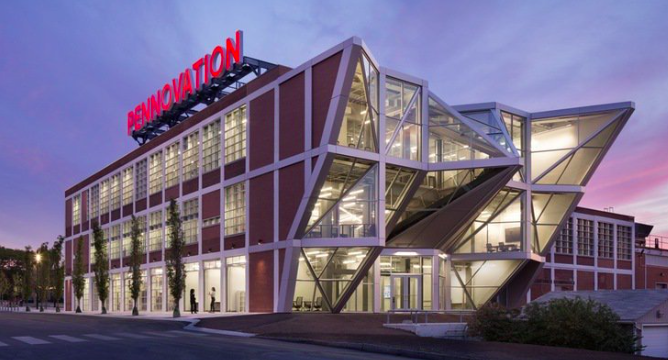 In a city that has sometimes been faulted for favoring competition over collaboration among start-up ventures, the 23-acre Pennovation Works campus is as much a social experiment — an agora for local entrepreneurs — as it is a West Philadelphia birthplace for commercial-grade technology. "The future ain't what it used to be," Penn President Amy Gutmann told a crowd of several hundred people, quoting Yogi Berra via French poet Paul Valéry. "It's better." Six years ago, the University of Pennsylvania bought the old DuPoint industrial site with the vision of a village for the city's most knowledgeable innovators in business, medicine, technology and social engagement. The ultramodern facility that emerged last summer, a 58,000-square-foot adaptive reuse of the former paint plant, was designed by New York-based HWKN and KSS Architects, with management led by Benjamin's Desk. "Our goal was to create these run-ins that change the game of innovation," said HWKN co-founder Matthias Hollwich, "where biochemists meet engineers and entrepreneurs. This building won't be famous for architecture but for innovations that will change the world and make it a better place." Conceptual rendering of Pennovation Center. How that will happen becomes obvious from the moment you step foot inside the building. It's bright, it's bustling and it's filled with advanced equipment that hums behind inviting windows, yet optimism and curiosity are the strongest forces in every room. Central bleacher of Pennovation Center. Laurie Actman, COO of the Penn Center for Innovation (PCI), said it's an energy that will put Penn and Philadelphia more on the radar nationally and internationally. "We want to create the platform for partnership between Penn, the private sector and entrepreneurs that will grow the ecosystem here," Actman said. "Projects like this help to reframe the perception of what's going on in Philly. Spaces like this are the glue and landing pad for collaboration." "My goal is to see a critical mass of companies get here so we can build a community of entrepreneurship," added Michael Poisel, Director of PCI Ventures, the service-providing arm of PCI that incubates early-stage startups by securing the investors who can lead their technologies to commercialization. "We're starting to see that in small ways already. Over the last five years, there's been a real cultural change in Philadelphia. When you see meet-ups, you go there expecting 30 people and there are 400." On the third floor of the Pennovation Center is the Penn Engineering Research and Collaboration Hub (PERCH), a robotics lab where Ghost Minitaur, the guy who brought up the scissors, came to artificial life. PERCH Director Daniel E. Koditschek, Penn's Alfred Fitler Moore Professor, stands watch over a large space where students are teleoperating half a dozen robots. One of them crashes loudly into a desk. "He's practicing his leaping," Koditschek chuckles. At this stage, many of the robots coming to market are service-oriented orderlies who can take over errands and custodial tasks at hospitals and other institutional settings. "We're thinking about much, much more unstructured environments like first-responder situations, earthquakes, disasters, very rough terrain," Koditschek said of PERCH's spinoff company Ghost Robotics. "That's the frontier for the physical side of the machines. We're building legged machines without gears, just raw motors feeling and sensing the world." Autonomous robots like these in the natural world are about a decade away for Ghost Robotics. Current PERCH researchers are using RHex robots to to work with aeolian scientists to conduce climate observation and study the process of desertification. "I think about this a lot being in the AI [artificial intelligence] and robotics space, and also being socially conscious of who we're taking jobs away from," Cleveland said. "Especially in this arena, it's often people who work in disadvantaged circumstances. The thing about what robots can do ultimately is it takes jobs away from everyone, so where does that leave humans? In an interesting place, maybe, where we can pursue whatever we want to do. Maybe we haven't even thought about the potential that we have as a species beyond what we currently are." Inside one of the final "inventor garages" to be leased at the Pennovation Center, Anthony Bannister is one the minds of an incubator that fosters the motivational and conceptual processes of positioning startups. "We're like a Weight Watchers for innovators, entrepreneurs and small businesses to support them as they go through their process," Bannister said. "Some people just have an idea, but they don't know how to connect the next pieces. They have a dream. Hence, we can make that dream Dreality." Bannister said Dreality — which holds minimal equity in its client companies — believes everyone has a story, but sometimes they don't realize it comes from an unexpected place. "Most people don't think they have a story. Most people don't think they have value," said Bannister, a musician who first got involved with Penn through its community-based Nonprofit Institute and has followed the beat of opportunity ever since. "What we realize, the worse the story, the bigger the glory. It's kind of like the best comedians have the most harsh lives. Don't get so upset about what you've been through. Share what you've been through. That's your power. It's also a gift. If you can see it, accept it and give it away." 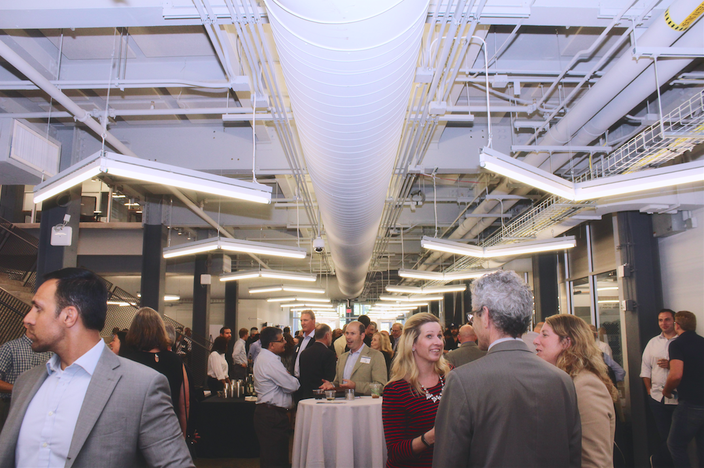 Pennovation Center launch event on Oct. 28, 2016. Bannister's comments touch on the company side of what was said earlier in the afternoon by Neil Blumenthal and Dave Gilboa, co-founders of the fast-growing Warby Parker, an online retailer of eyeglasses with a "buy one, give one" social mission. During a Q&A session with president Gutmann, the duo discussed not only addressed the delicate balance between following strategy and opportunism, but also the secret to innovation and disruption when you put the gadgets themselves aside. "It's all about bringing new ideas to life," Blumenthal said. "And understanding the real problems you're trying to solve. Do those problems frustrate people? What doesn't make sense to you in your daily life? Every one of those things is an opportunity to innovate. You can now achieve that and scale faster than ever before." The first phase of the Pennovation Works campus was completed for $37.5 million, a number Penn and its community of innovators believes will pay itself back many times over in both financial and differential terms. "Penn is the world leader in cell and gene therapy," Poisner added. "We have companies now that are looking to cure cancer. Karma believes they have a potential treatment for solid tumors and Team Unity is working more on the liquid tumor side to treat leukemias." Corporate sponsors at the site include The Hershey Company, Comcast, Qualcomm Research Philadelphia and Merck, all of which will both fund and participate in research endeavors. That could include everything from neuroscience and informatics to energy tech, nanotechnology and puppies. Yeah, the Penn Vet Working Dog Center is training a future generation of canines to search and rescue, sniff out indicators of disease and detect bioterrorism threats. 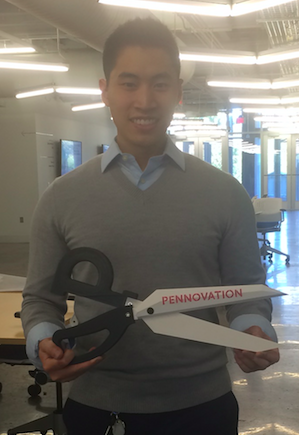 Penn grad and mechanical engineer Jeremy Wang. The 3D-printed scissors were designed and fabricated on the first floor by Jeremy Wang, who joked that he wasn't totally 100 percent sure they would cut the ribbon. You never know if you don't find out. There's a lot of room around what's been called Philadelphia's Forgotten Bottom neighborhood, situated along the edge of the Schuylkill river where the Pennovation Center sits at 34th Street and Grays Ferry Avenue. By the end of next year, the Schuylkill Crossing Trail will eventually connect this neighborhood to University City, where together with Old City, Philadelphia's biomedical research and software innovation markets have grown mature. Throw in Center City's East Market project, and things are looking as bright as they ever have for the city's entrepreneurial ascension. Pennovation Works will almost certainly expand in the years to come, adding new facilities and welcoming new forms of collaboration. For now, there's a lot of empty space on those walls. And Chelsea Hrynick Browne, a paper-based and recycling artist based in New York City, made her way down to the Pennovation Center to inspect the scene. She's collaborated in the past with Fishtown-based COSACOSA art at large, Inc. for an installation at The Children's Hospital of Philadelphia. This time around, she's got her eyes on the 3D printing team. It takes all types. "If you want to travel fast, travel alone," Browne said, quoting the familiar African proverb. "If you want to travel far, travel together."